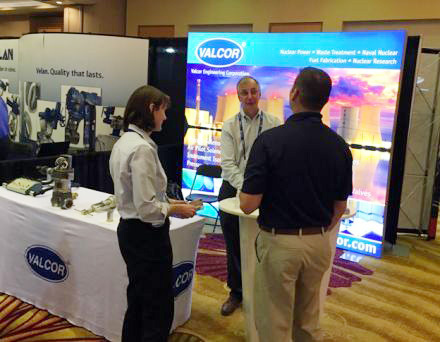 Valcor Engineering’s Nuclear Group recently exhibited at the AUG/MUG 2019 Joint Conference, which was held January 14-17 in Palm Desert, California at the JW Marriott. This conference was a joint meeting of the Air-Operated Valve Users’ Group (AUG) and the Motor-Operated Valve Users’ Group (MUG). AUG is dedicated to the development and exchange of technical information concerning the performance, design, testing, and maintenance of air-operated valves, compressed air systems, and fluid leak management programs. The focus of the AUG portion of the conference was geared toward improving efficiency, equipment reliability, and safety in industries such as power generation, chemical, oil & gas, naval, and other industrial process control applications. MUG is a group of member nuclear utility representatives formed for the exchange of technical information relating to the testing and maintenance of motor-operated valves among the utilities and in coordination with other organizations within the nuclear industry or the increased reliability and safety of nuclear power.